Well, the things I’m finding while tidying up the house! 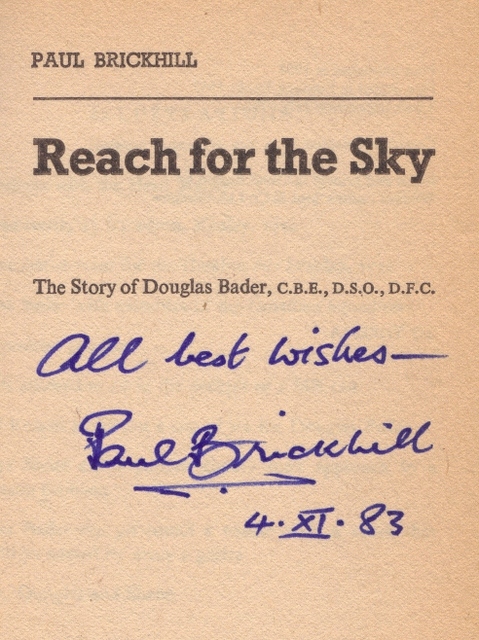 I had forgotten about this in a 1981 reprint of Reach For The Sky and thought it might be interesting. Paul Brickhill (20 December 1916 – 23 April 1991) was an Australian writer, whose World War II books were turned into popular movies. 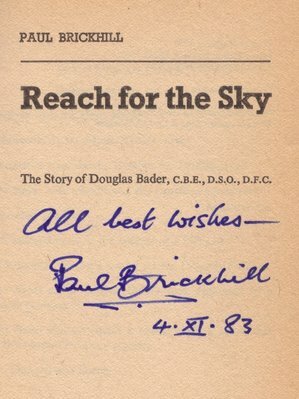 These included Reach for the Sky, based on Reach for the Sky: The Story of Douglas Bader, Legless Ace of the Battle of Britain; The Dam Busters, based on The Dam Busters, and Operation Chastise, the destruction of dams in the Ruhr valley by RAF No. 617 Sqn; The Great Escape, recounting the events of the 1944 escape from the German prisoner of war camp Stalag Luft III. Paul Brickhill was himself a Spitfire pilot who was careless enough to get himself shot down in 1943, spending the remainder of the war as a “guest” of Stalag Luft III. Brickhill was barred from participating in the actual Great Escape due to claustrophobia although he was active in implementing the plan.